1.1 How high is high? Another risk at altitude is that it may get very cold. This article does not cover that; see Travelling in cold weather. Air at lower pressure has less oxygen per lungful. Your body adjusts to this by making more red blood cells to carry oxygen more efficiently. However, this process takes more than a week, and in the meanwhile, you may be ill. The changes to your body at altitude are complex and can be quite dramatic. The difficulty your body has maintaining a good oxygen supply and keeping related problems under control is directly related to how high up you are, and also to recent changes in your altitude. 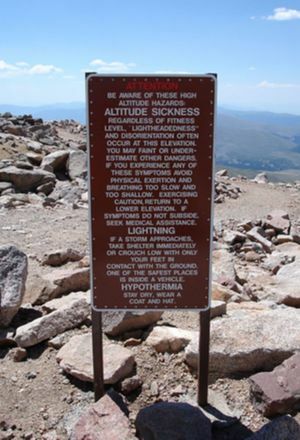 These are the two major factors that cause altitude sickness. Hence this article talks a lot about ascent and descent. Ascending further away from sea level is the risky activity and the time you must be alert. Conversely, descending towards sea level is the single most important factor in reducing or eliminating all forms of altitude sickness. Increased urine output is a response to hypoxia : increased output of bicarbonate makes it possible to increase breathing. This will make you urinate a lot at altitude. If you aren't urinating much more than you usually would, then you might actually be dehydrated. You need to increase your fluid intake at high altitudes. The loss of appetite, a precursor to nausea, can lead you in to a dehydration headache. Unfortunately, it is easy to mistake dehydration headaches for AMS (below) headaches and vice versa. If a headache does not improve after drinking a liter of water it should be considered as an AMS effect. Dehydration headache can also be recognised by comparing pulse rates: if your pulse rate goes up more than 20% when standing up after lying down for five minutes, you need more fluids. HACE symptoms include a number of signs of failing mental function: confusion, fatigue and unusual behaviour. But the most reliable one is gait ataxia, and you can test it by walking heel to toe along a straight line on the ground. Healthy people can pass this test easily, anyone who has difficulty balancing while they do it may be showing signs of HACE. High altitude pulmonary edema (HAPE) is another severe altitude illness. It sometimes occurs in conjunction with AMS or HACE, but sometimes doesn't — it's thought to have different causes. When you have HAPE, your lungs fill with fluid. Signs include extreme fatigue; breathlessness (when not due to interrupted breathing — give yourself 30 seconds to recover upon waking); a cough, especially if it is wet and has blood in it; rattling or gurgling breath; chest congestion; very fast heart rate; very fast breathing; and blue extremities. A fever is sometimes present. It most commonly sets in at night. Remember to drink adequately - around one liter extra of fluids per day. Pushing large volumes of water does not protect against AMS , and can give the same symptoms ( headaches , nausea , vomiting and more ) as severe AMS from electrolyte imbalance. Go no higher than 2400 meters (8000 feet) the first night. During acclimatisation, drink a lot of non-alcoholic drinks. Local recipes like mate de coca in Peru (tea from coca leaves) are fine, but their effect is doubtful. Rapid ascents are the opposite of acclimatization; you make a rapid ascent when you're gaining altitude faster than recommended. This may mean climbing and camping higher than recommended, but you can also make an even more rapid ascent by driving to a high altitude location, and flying from low altitude to high altitude is an even more rapid ascent. For example, flying from sea level to Lhasa, Tibet, which is 3700 meters (12,000 feet) high, is distinctly unwise. Consider spending a week or so at an intermediate altitude; see Overland to Tibet for some possibilities. If you are going to travel around Tibet — where some inhabited areas are over 5000 meters (16,000 feet) and some mountains over 8000 meters (26,000 feet), do not set out until you are thoroughly acclimatised in Lhasa. Consider road or rail travel rather than flying directly to somewhere with a very high altitude — but remember that the surface option often involves a lot higher altitudes: the Manali-Leh road for example will take you from below 2000 meters (7000 feet) to 5000 meters (16,000 feet) in less than a day. Or fly in stages, stopping somewhere at moderate altitude in between. If you must fly to any destination about 3000 meters (10,000 feet) at least spend a few days at some intermediate destination en route. If flying to a more moderate altitude above 2500 meters (8000 feet), you will still want to spend several nights at that altitude before setting off into higher country. This drug (sold as Diamox) stimulates your breathing. The drug was originally designed as a treatment for glaucoma, but a side effect of increased breathing rates and depth have proven useful to climbers. It has the effect of increasing acclimatisation rates; improving periodic breathing; and helping people recover from AMS more quickly. There are some side effects. The drug has a mild to moderate diuretic effect , so adequate amounts of fluids is important. This drug can be useful for people who have had AMS in the past; people on a forced ascent (for example, flying into Lhasa); or taking the landroute there from Kathmandu , and anyone who has AMS, particularly if they are choosing not to descend. Many climbers also take it as a prophylaxis. Salmeterol (Serevent), temazepam (Temaze), nifedipine and dexamethasone. Some of these drugs are found in capsules sold in China e.g. Gao Yuan Kang (高原康), which contains dexamethasone. Some herbal preparations are also purported to prevent/treat high altitude illness, such as gingko biloba and a combination capsule called Gao Yuan Ning (高原宁), sold in China, and coca leaves, found in South America. The effectiveness of these preparations remain scientifically unproven, although Gao Yuan Ning (高原宁) is used by Chinese military personnel in cases of rapid ascent. It is extremely important to note that all these drugs can have significant side effects, especially dexamethasone, a potent steroid medication. Tourists are advised to consult their doctor prior to obtaining these medications. Foreign tourists should procure any necessary medications in their home countries and note the ingredients contained in the medications. The information in this page is in no way a substitute for official medical advice. This page was last edited on 17 November 2018, at 16:18.